According to an article in the MetroWest Daily News, a man and a woman were arrested in Framingham earlier this week by police officers searching for a suspect in an unrelated crime. The article states that the police went to 10 Main Street in Framingham looking for a suspect believed to be involved in a pistol whipping incident at UMASS Amherst that occurred two weeks ago. The man and woman that were arrested reside in one of the apartments at the Main Street address – the police specifically went to the address because they reportedly “had word” that the suspect in the UMASS incident was friends with the female resident. When the police arrived, they immediately arrested the woman, who had an outstanding warrant for a probation violation. According to the article, the police obtained a search warrant for the apartment and then proceeded to search the residence for the suspect in the UMASS incident. The suspect was not located, but during the course of the search, the police found “a large amount of marijuana” (approximately half a pound) located in several jars under the sink. In addition to the marijuana, officers also reportedly found $5,000 in cash, several scales, empty plastic bags, and other evidence of marijuana growing – there is no information as to where these items were found. Following the discovery of the marijuana and other items, the officers arrested the male resident as well. 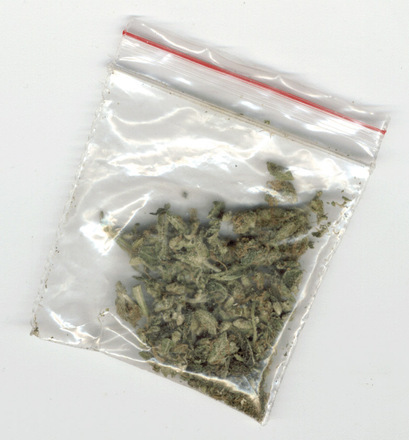 The man and woman were subsequently charged with possession with intent to distribute marijuana. Fortunately for the defendants, there does appear to be a viable motion to suppress. A motion to suppress is a written request by a defendant asking the court to keep certain evidence from being introduced against them at trial because that evidence was obtained as a result of unconstitutional or illegal police activity. The Fourth Amendment to the United States Constitution guarantees a person’s right to be free from unreasonable searches and seizures. The police have a legal basis to enter a home if they have a search warrant, as long as the search warrant is supported by probable cause to believe that evidence of a crime is present in the location to be searched. If the search warrant is not supported by sufficient probable cause, however, evidence obtained as a result of the search should be suppressed. Here, the defendants may be able to argue that the search warrant lacked sufficient probable cause to permit a search of the home, and that the search exceeded the permissible scope of the warrant. Although the police may search a home for an individual if the search warrant establishes sufficient probable cause to believe that that individual is in fact in that location, the police do not appear to have a sufficient basis to establish such a belief in this case. Specifically, the article states that the police simply “had word” that the suspect that they were looking for in relation to the UMASS incident “was friends” with the female resident. There does not appear to be any additional information supporting probable cause to believe that the suspect was staying at the address, or that he or she would be found there at the time that the police conducted the search. Further, the police are only allowed to search areas in which the evidence they are seeking – in this case the UMASS suspect – could be found. Given the fact that the article states that the marijuana was found in a jar under the sink, there may be an argument that the suspect could not have been found under the sink, and certainly would not be found in a jar, and therefore the police lacked a legal basis to search those areas. Likewise, if the other incriminating evidence was found in a drawer, shoe box, or someplace else that the suspect could not possibly be hiding, the defendants can argue that the search exceeded the scope of the warrant. Regardless of the strength of any motion to suppress that might be filed, however, the defendants are both facing serious charges and need an experienced attorney to evaluate the evidence, research the relevant law, and persuasively argue the motion to suppress to the court. Attorney Daniel Cappetta is well versed in search and seizure law and has successfully litigated numerous motions to suppress. Call him for a free consultation today.